Add detail to the smiley face, bit by bit, until you're looking at something an artist like Alex Ross might draw, almost photographic, and you throw up a kind of identity force field. The more someone looks specifically and uniquely human, the harder it becomes to pretend they're you, the flip side being that your potential to relate to them empathically--and appreciate all the idiosyncrasies of their "not-you" personality--increases. 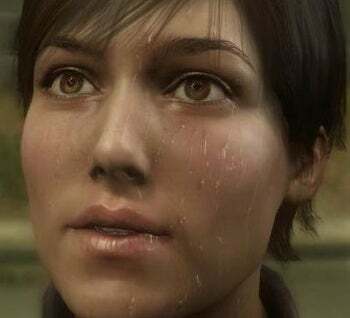 In Heavy Rain, the characters look more like actual human beings than any I've encountered in a video game. What's more, they sound and behave more like actual human beings, too. 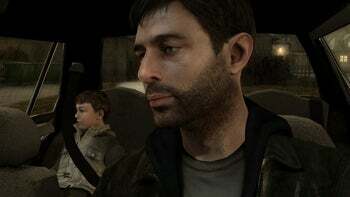 In Heavy Rain, you feel entirely responsible, because the choices you make alter their fate. And that's what's changed: You're participating in a narrative that combines the visual plausibility of a movie with the choice-and-consequences mechanics of a video game. And you care more about what happens to these people, strangely enough, because they're so definitively not you.